Lizards require five to seven feedings per week due to their high metabolic rates. Their diet depends on the type of pet lizard you have chosen: carnivorous, herbivorous, insectivorous or omnivorous. The pet store where you purchase your lizard will provide this information. It's essential to know what type of lizard you have so you can provide him with a well-balanced, healthy diet. If your pet lizard is carnivorous, he is well-suited to having a live or prepared rodent such as mice. Keeping frozen mice on hand is wise. Your lizard will begin to pick at the frozen mouse, consuming the remainder when it thaws. Your pet carnivorous lizard's diet also should include crickets, fish, mealworms, silkworms, butterworms, earthworms and larvae. A herbivorous lizard needs plenty of variety when it comes to his diet. Your goal should be to provide a wide variety of foods for your pet lizard similar to what he would find in his natural habitat. Always make sure the food you provide for your lizard is herbicide and pesticide free. His diet should include foods such as alfalfa, apples, barley, bean sprouts, beet tops and leaves, carrot root and leaves, corn kennels, escarole leaves, fresh figs, grass clippings, mulberry fruit and leaves, okra, pea pods, fresh pear pulp and unsalted sunflower seeds. Insectivorous lizards have access to a variety of prey in the wild. Their diet consists partially or completely of insects. 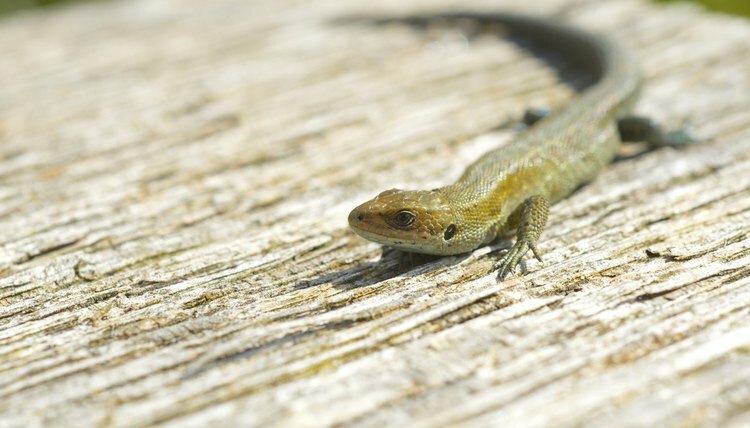 You will want to include mealworms, pill bugs, sow bugs, bees without a stinger, grasshoppers, flies, cicadas, silkworms, wax moth larvae, tomato hornworms, fruit flies, cockroaches and crickets for your insectivorous pet lizard to provide him with a well-balanced diet. If your pet lizard is omnivorous, he eats the most varied diet compared to the carnivorous, herbivorous and insectivorous lizards. Omnivorous lizards eat a wide range of food such as plant greens, small insects and animals. Most commonly he will consume flowers, vegetables, insects and meat. You will find that your pet omnivorous lizard may favor meat over vegetables or vice versa. It's highly important to provide a well-balanced diet for your pet lizard, even if he prefers one food over the other. What Kind of Caterpillars Are OK for Chameleons?